So much of my work is a balance of progress and conservation. Now, more than ever, that’s playing out at home. Tracy and I are working to turn Old Town, our Williamson County home on the Old Natchez Trace, into a thriving farm while preserving and honoring the property’s centuries-old history. 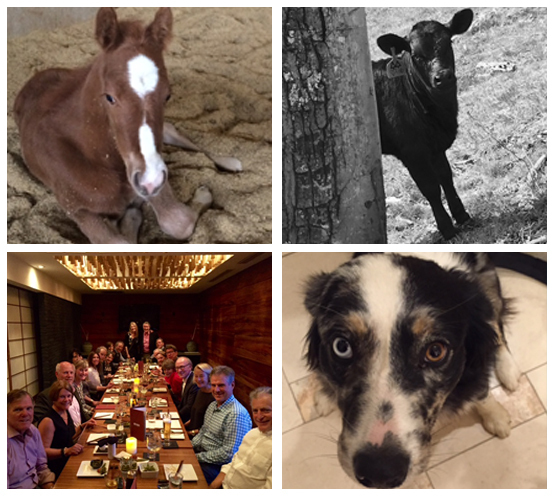 We welcomed new members to our family this month. Pryor Lillie the calf is named after Old Town’s 1846 builder. Two new colts, Risa and Ray, will join us at Old Town next month. And Nickle, our little Australian Shepherd, keeps us all in line. At the same time, we’re working closely with Kevin Smith, a local archaeologist and anthropologist to preserve the 800-year-old Mississippian temple mounds that serve as the foundation for Old Town. As always, we love welcoming friends from all over the country to Nashville. With Kix and Barbara Brooks we hosted a delegation from California a few weeks ago, touring some of the best of Nashville: the Bluebird Café, Vanderbilt, and the Frist Visual Arts Center. And I never miss the Mule Day Parade: an annual event in Columbia, Tennessee, dating back to 1840. Today we begin two weeks of travel that will encapsulate that same push and pull. Before we go, I wanted to share with you some of what we’ve been up to and some of the important work ahead of us. We will be sharing details of the trips and what we learn on social media. Follow along on Twitter (@bfrist) or Facebook (SenatorBillFrist). We will be representing Hope Through Healing Hands and the Bipartisan Policy Center at the Vatican this week at the Cellular Horizons conference (#UniteToCure) to discuss the latest in regenerative medicine. I’ll be speaking on the Speeding Cures panel—an issue that weighs heavily on me. Late last year BPC recently released a report that I co-chaired with Representative Bart Gordon on cellular therapeutics. In the report, we encourage Congress and others to work to advance medical innovation legislation. This will require changes at FDA and in how research is structured. There’s an act pending in Congress now to apply some of these needed changes. The REGROW Act is bipartisan, bicameral legislation based on the BPC’s December report and would create an expedited approval category for adult stem cell therapy that would allow for conditional approval after Phase I and Phase II trials are complete, and evidence of safety and effectiveness is demonstrated. This could make a huge difference for how quickly we can develop life-saving drugs. For the first time ever, the Board of Directors will visit TNC’s projects in China, and we are thrilled to be able to see some of the conservation projects underway in Sichuan, Beijing, and at 3 Gorges Dam. TNC’s goals in China include establishing land trusts, reforestation efforts, and working with the 3 Gorges Company to ensure the survival of the fisheries and communities downstream from the dam. All of this is important work, and we are anxious to be on the ground and see the progress being made. NashvilleHealth is picking up steam, working hard to create a culture of health for all of Nashville. We hope our model will be a standard that the rest of the country can look to as we pursue better health for all. Follow us on Facebook to stay up to date! There is a gaping hole in our access to care. Access to mental health care must be improved. What should a cancer “moonshot” actually look like? All children should be educated and equipped for their futures. But how to best do that? SCORE launched a SCORE Institute in partnership with Project Renaissance to look at how students move from poverty into the middle class. Community partnerships are working for education in Tennessee. SCORE highlights four that can be models of success. SCORE’s Executive Chairman and Chief Executive Officer, Jamie Woodson, explains the new statewide report Equitable Access to Highly Effective Teachers for Tennessee Students and lays out the first steps toward addressing Tennessee’s “effective teaching gap”. This entry was posted in Blog, Hope Through Healing Hands, NashvilleHealth, Newsletter, TN SCORE. Bookmark the permalink.